The Japanese name of Sun Wukong, the Monkey King, is Son Goku. Sun Wukong (孫悟空) is known/pronounced as Suen Ng-hung in Cantonese, Tôn Ngộ Không in Vietnamese, Sun Ngokong in Thai, Sun Gokong or Sun Go Kong in Malay and Indonesian, Son Ogong in Korean, and Son Gokū in Japanese. Some question here refer to Goku from Dragonball as Son Goku. A number of images of Sun Wukong show him on a cloud with a staff, similar how Goku in the original Dragonball Series is shown with Nimbus and his staff. So, I am wondering if Goku in Dragonball is based on Sun Wukong from Journey to the West? Akira Toriyama was definitely influenced by Journey to the West in writing the original Dragon Ball manga. 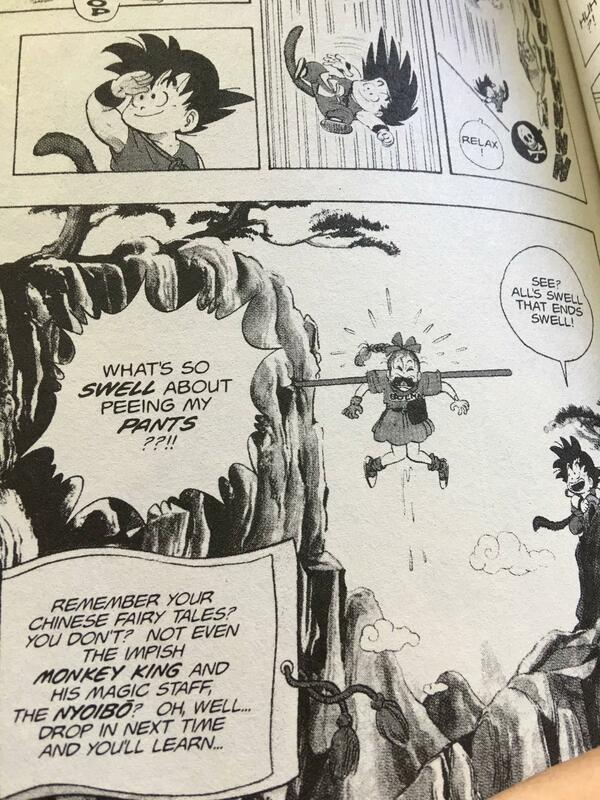 In early stories, Goku rides the Flying Nimbus cloud and wields an extendable staff, two aspects taken directly from his inspiration the Monkey King along with his name, and the fact that he turns into a giant ape is also a callback to his simian origins. The quest to find the Dragon Balls was also a parallel to the quest for the sutras, or scrolls of the Buddha, and some of the other characters from Dragon Ball have parallels to Journey to the West characters, although they tend to be a little tenuous at times. And, of course, it didn't take long before the original story gave way to all the craziness and martial arts and ridiculously scaling power levels to the extent that by the time Dragon Ball Z came along the resemblances are superficial at best. You can see mention of the connection in the Wikipedia article, although the sources are mostly print ones so you'd have to put a little leg work in to track them down yourself. See the last panel of this last page of the first chapter of Dragonball that alludes to Journey to the West. Not the answer you're looking for? Browse other questions tagged culture dragon-ball-series or ask your own question. Does anime really account for 60% of the world’s animation-based entertainment? Is the Ship Spirit (klabautermann) based on any real legend?